There are three contending narratives regarding the financial reform legislation that this week approaches its final hurdles in the US Senate. The first narrative is “the reforms would make things worse.” This view, advanced recently by some Republican leadership, seems to have receded in recent weeks – at least with regard to systemic risk – particularly after Senator Ted Kaufman dealt with it rather brutally on the Senate floor. For the most part, this line has sunk down to the level of sneaky astroturf campaigns. There is still a rear-guard action by special interests against consumer protection on financial products, but here the administration started out with a sensible vision and – with strong support along the way from the likes of Elizabeth Warren – reasonable safeguards will eventually emerge. The biggest remaining item is probably the Whitehouse Interstate Lending Amendment, which would definitely help – call your senator, but only if you don’t like being gouged by credit card companies. The second narrative is “Obama administration as heroes.” Against the odds, in this view, the administration has prevailed in the teeth of tough opposition. The problem with this story is that – even in the official version – the only people who have been trying hard to strengthen reform, beyond the initial proposals, over the past year are those relatively outside the main White House-Treasury team: Gary Gensler and Paul Volcker. Gensler has won some battles – although the final outcomes on derivatives are not yet clear. And, in any case, the industry won its main battle some months ago when the “end user” exemption prevailed. The big broker-dealers in over-the-counter (OTC) derivatives mobilized their clients to lobby the Senate Banking Committee – it was all handled in the most professional and (socially) damaging way possible. This loophole seems relatively small now (10-15 percent of all OTC derivatives), but no doubt it will expand greatly over time. Watch this space closely for the next crisis. Volcker’s ideas are still in play – in fact, the big fight this week will likely be on the Merkley-Levin amendment, which would greatly strengthen the idea that the biggest banks should stop already with their “proprietary trading”, which leads them into great and completely botched risks, as well as repeated conflicts of interest with their clients. The big banks have no good arguments on their side – they are reduced to asserting that being able to take risks in this manner actually makes the system more stable, a point directly contradicted by their experience in the run up to September 2008. 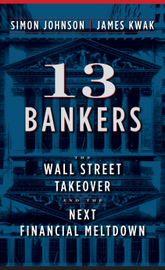 It was the bank’s own holdings of “toxic assets”, you may recall, that were the focus of rescue attempts organized by both Hank Paulson and Tim Geithner. Holdings at this scale were not acquired in the day-to-day mundane business of bringing buyers and sellers together. Instead, very smart people at the big banks thought this was a good investment – a point on which they proved devastatingly wrong. The administration says it favors Merkley-Levin, but let’s see how hard they fight for it. Personally, I rather expect their support will be lukewarm and this will ultimately not tip the balance. I’d be happy to be proved wrong. More broadly, of course, all of these reforms add up to little more than “baby steps”. The big mistake was made long ago, when the administration decided not to push the megabanks when they were politically weak (the argument of 13 Bankers). This was only compounded and confirmed when Treasury and the White House came out against the Brown-Kaufman amendment. As we argued in our start-of-the-year piece on Bloomberg, all of this sets us up for another boom-bust cycle, this time centered around emerging markets. Savings will be recycled out of emerging markets through “too big to fail” banks and similar institutions in the US and some parts of Western Europe – generating debt-based capital flows back into other parts of those same emerging markets. “China can only go up”, “Russia is back”, and “Brazil and India are now different” are the siren calls. And of course, to some extent there is truth in this rhetoric – but the expectations are already becoming exuberant. All great bubbles begin with a truly convincing shift in fundamentals. And many of them are all kept going by reckless lending on the part of Citigroup and its competitors – remember emerging markets in the 1970s and 1990s, US commercial real estate in the 1980s, and US residential real estate in the last decade. This entry was posted in Commentary and tagged financial reform. Bookmark the permalink. All great bubbles begin with a truly convincing shift in fundamentals. Really? What was the “truly convincing shift in fundamentals” that led to the housing bubble? Houses look the same to me as they did 100 years ago. Well, not that I was around 100 years ago, but you know what I mean. Am I missing something in this post? The intro says there are three narratives about financial reform but I only see two mentioned. Is the third narrative only for paying subscribers or otherwise kept hidden from the rest of us? Houses look the same? Maybe. But during the bubble, they grew larger, had more bathrooms, granite counters, and stainless steel appliances. And for many, many homeowners they looked like ATMs instead of houses. If you consider stainless steel appliances a “truly convincing shift in fundamentals”, you need to get out more. Homeowners using their houses as ATMs was an effect of the bubble, not the cause. What the housing bubble proved, actually, is exactly the opposite of Prof. Johnson’s statement. You do not need any shift in fundamentals to get an enormous bubble. All you need is low interest rates and the “me generation”. thrown in the briar patch. I was wondering where that went too. I suppose the narrative that the bill’s a scam meant to look like reform and help drag the Dems across the finish line in November, but not meant to actually reform anything, is so disenfranchised and non-existent in establishment discourse (outside the “Overton window”) that it doesn’t qualify, if the definition of a “narrative” is something being audibly pushed by some power center. But while “the Dems are heroes” and “this bill will make things worse (in some vague, unspecified way) because it’s too strong” have obvious attraction for power factions, “this bill is way too weak” has no such constituency. The big shift in fundamentals didn’t occur all at once for the housing bubble, but a series of events took place to really change the fundamentals to allow the housing bubble to occur. The repeal of Glass-Stegall allowed the big banks to get into the game “so to speak.” Then the emphasis on the “Ownership society” and exuberance in the housing market (ATMs as mentioned previously) provided for the direction. Finally the incentives for putting people in houses with little regard for how it would be payed off, and the CDS derivative(s) “illusion” of safety (hedging) provided the fundamental changes (fuel) necessary for the bubble. Each item on it’s own it not necessarily a bad thing, but the combined results are (as we see now) disastrous. Like many disasters throughout history, it is a combination of small “innocent errors” that add up to a major catastrophe. Basically we got a little too confident and reached a little too far. Now we need to put the safeguards back in place and try to figure out where to go from here. The thing that really galls me about all of this is that we (the public) provided their backstop (money) when things were “bad” (it’s really arguable whether they are any better now), and now that mark-to-market is gone and mark-to-myth seems to be the “in” thing and times are good for the big guys again, now they are using our backstop and the relaxing of a few rules to reap these big profits which they then use to lobby against us making the necessary changes so that this doesn’t happen again. Is it just me, or does anyone else see that the mental patients are running this asylum? I think the fundamental shift in the US housing market was the role that Fannie & Feddie (& to some extent the CRA) played in propping up demand. Prices generally rose in all markets as the government tried to increase homeownership, and this price appreciation, based on a fundamental shift, outgrew the fundamentals and became a debt-laden football the banks were only too excited to play with. Is that fair? Let me preface this comment with a note that I am in over my head. At the same time, I have a good nose for smart, honest…. I am wary of legislation weighing pounds. I cannot believe that the proposed financial “reform” will do any such thing, never mind the red flags I encounter left, right. I stumbled across this, today. Intuitively, it “feels” kinda “right.” Certainly, it is short, simple. Does the proposed regulation tackle this, I wonder. Dunno. “….to regulate and monitor the hedge funds and the hedge fund short sellers, some of them which are registered off-shore to avoid scrutiny. These global operators, with investors who remain mostly anonymous, must be compelled to register with the Securities and Exchange Commission (SEC), publicly disclose their positions in the markets, and maintain accounting and trading records for a period of 10 years so their activities can be monitored and scrutinized. Just like mutual funds, they must be prohibited from engaging in day trading activities. •	Reinstate and restore the short sale price test regulation known as the uptick rule (to its original condition and not modified). •	End mark to market accounting and replace it with book value, historic cost accounting. I continue to be amazed that Simon and James might think that, beyond rhetoric, there is anyone in America who does not see the need for some simple new rules and regulations. I am surprised, however, that they would support the present legislation (with or without additional amendment verbiage). ..an astroturf community of sly supporters of Wall Street bonuses, beyond the fiends themselves. Smoke and mirrors is not going to save the world. And you guys know this mess spreads well beyond our shores. We may well see the collapse of the Euro this week, like a house of cards in a breeze. Houses had a fundamental shift because years ago because middle class jobs allowed people to save and put a minimum of 20% down. Houses also had a fundamental shift in the expectation from homeowners and investors that prices would always go up, making interest only loans on investment properties etc. It turns out leveraging is the big banks’ “contribution” to a better world. Where others make widgets, they make bubbles. Why not? After all, credit defaults are just another chance to move money and earn fees and bonuses, so it’s a win even when the “fundamentals” don’t make sense. Looks like restructuring credit markets will have to wait for people to stop looking at credit as a magic pill. I’m not holding my breath. Another fundamental shift, certainly in California and frequently elsewhere, was the property tax revolt. This allowed the financial sector to replace local governments as interest charges replaced taxes, thus creating new opportunities for lenders. Toothless FED audit = nominally worthwhile/possibly damaging bill. 96-0 vote for toothless is bi-partisan spital in the face of the public. Vote them all out. And then do it again until the financial-elite-backed candidates are purged. A large part of what began the housing bubble was restrictive zoning ordinances designed to limit the availability of housing in American suburbs. Starting in California but spreading throughout the country minimum lot sizes went from an eighth of an acre to a full acre and minimum square foot requirements went from 800 square feet to 2000. This began the process of driving up prices and of course had the effect of keeping undesirable groups out of middle class suburbs. The Economist has had several articles over the years on how much of the cost of housing in the U.S. is due to government regulation. The oligarchs win again. That should be the headlines after whatever passes for financial reform is finally enacted into law. We knew from the start that we should invest in the TBTF’s that aren’t going away until everything goes away. I am so sad for this country. We have a broad populace that is ADD when it comes to understanding things. The answers are really in the weeds, but no one wants to hunt for lost golf balls, or even figure out how they got so far in the rough. We just want to pull out another ball and keep playing. Lot’s of Mulligans, no penalty strokes. Well, my fellow Americans we get what we get when we chose to play ostrich. Yes, Simon, these are baby steps, unlikely to do anything but earn some extra money for the legal obfuscation teams working for the various powerful monied interests. We will end up with health care and financial reform that largely resembles in impenetrable tax code. The more pages, the more chance to hide advantages. The lobbyists are writing this one, once again, with bones for the dogs, but no meat. Someone pass poor Simon a beverage, he’s sounding a little down. I hear you, and your points are well-taken, but that’s why we need to keep up the good fight. It should be abundandly clear to you by now that the shift in fundamentals was a shift away from regulated markets and in favor of laissez-faire economics. Yes, a nightcap! (…and hope the the GS boys aren’t dreaming of sugar plums….